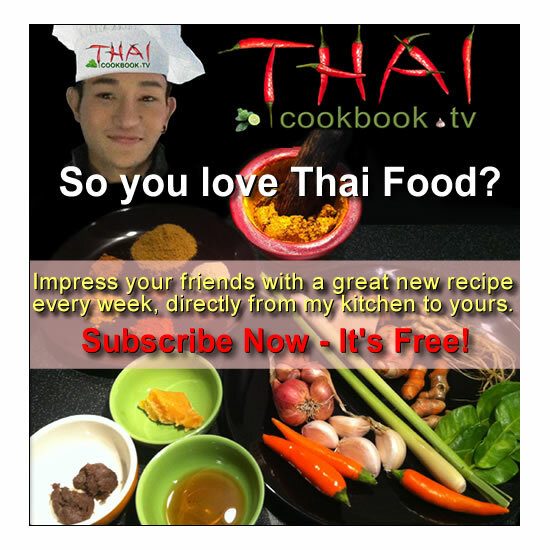 You should try this Thai Massaman Beef Curry. It's like a delicious Thai-styled beef stew that's loaded with chunks of juicy beef and soft potatoes in a rich, sweet and creamy coconut soup. 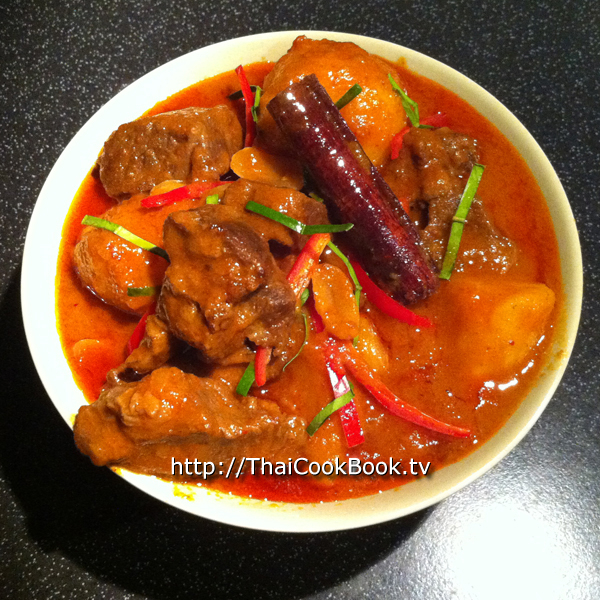 Kaeng Matsaman Curry (แกงมัสมั่น) is distinctly different in flavor from other red curries. It's not spicy (hot). You'll taste the subtle flavors of star anise, cardamom, cinnamon, cloves, pepper, and tamarind. 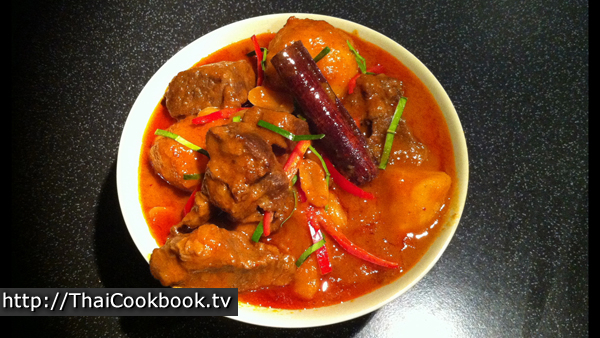 What's in our Massaman Curry with Beef. 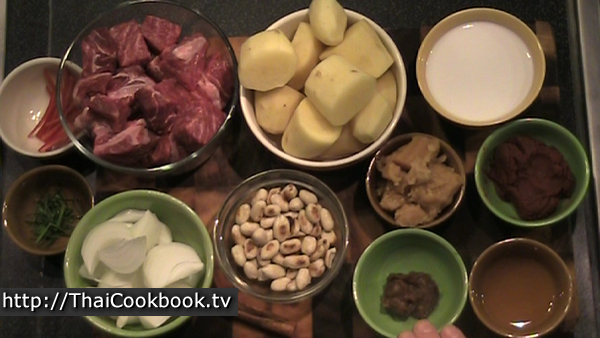 How we make our Massaman Curry with Beef. 1) Add 1 cup of coconut milk to a hot wok and bring it to a boil. Add the curry paste, stirring it in well. Let it fry for about 2 or 3 minutes. 2) When the oils in the curry and coconut are bubbling and separate from the spices, add the beef to the pan and stir into the spices until it is well coated. 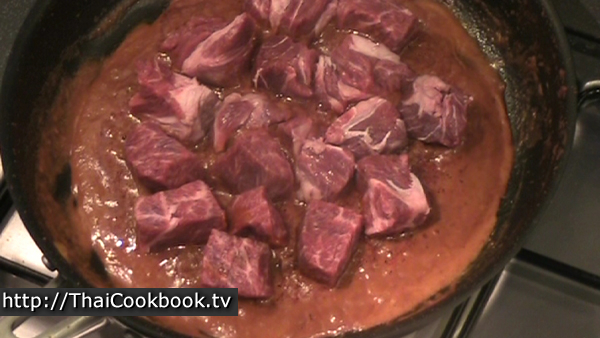 Fry on all sides until the chunks are well seal and lightly browned. 3) Add 2 cups of water, stir in well, and let it come to a nice boil. Then add the potatoes, onion, peanuts, cinnamon stick, and bay leaf. Simmer, covered, for about an hour. 4) Add the sugar and citrus juices. Stir well until the sugar all melts. Next, season to taste by adding small amounts of tamarind pulp until the flavor is a nice balance of sweet and just a little sour. 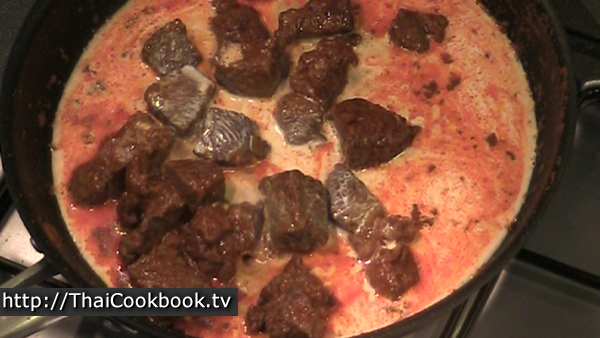 5) Remove from the heat and let stand for 15 minutes before serving. Toast 1/2 cup of fresh peanuts (shelled and skins removed) in a frying pan for about 5 minutes, or until they are well toasted and slightly browned in some spots. Divide the coconut into two 1 Cup portions. Cut the beefsteak into large chunky pieces of about 2 inches. Peel and wash the potatoes and cut them into large pieces. Peel the onion and cut it into thick wedges. Cut some mild red chili and kaffir lime leaf into thin slivers. Measure the rest of your ingredients and have them ready for quick access. 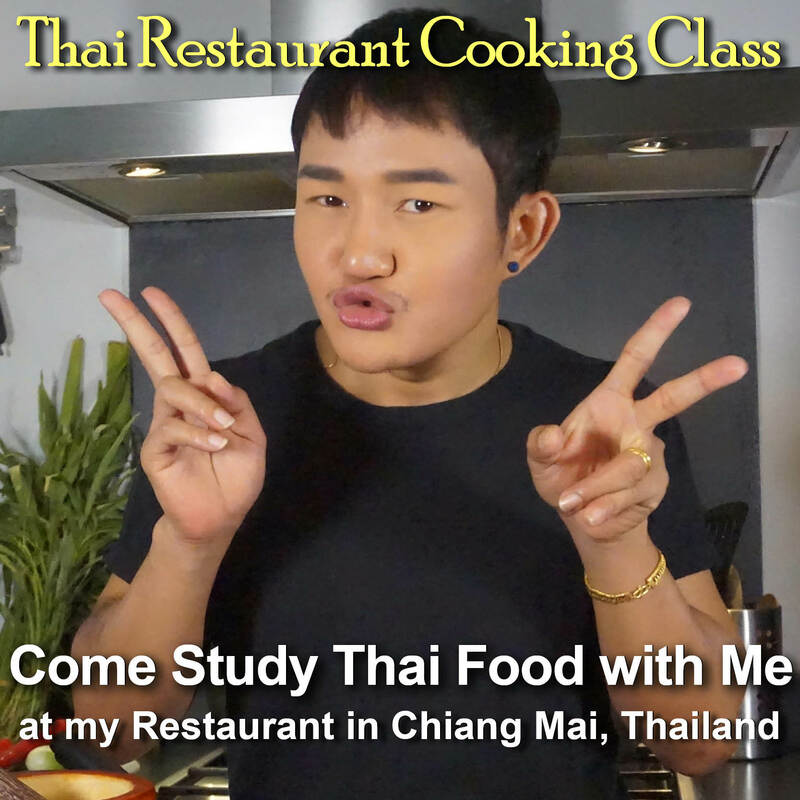 Heat a wok or deep frying pan, preferably one with a lid, over medium flame. Add 1 cup of coconut milk and bring it to a boil. 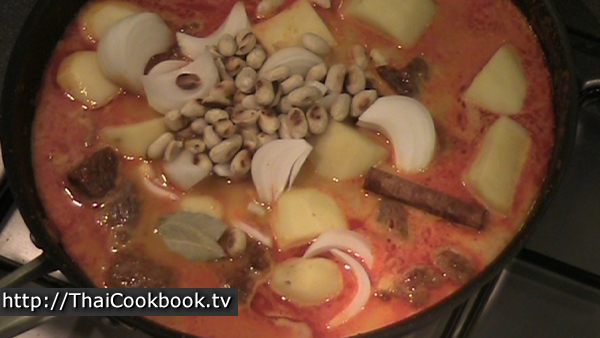 Add the curry paste, stirring it in well. Let it fry for about 2 or 3 minutes. As the water steams out of the coconut, what you will have left in the pan are mostly spices, and red oil. Let it fry until a lot of oil comes to the top, but be careful not to burn it. 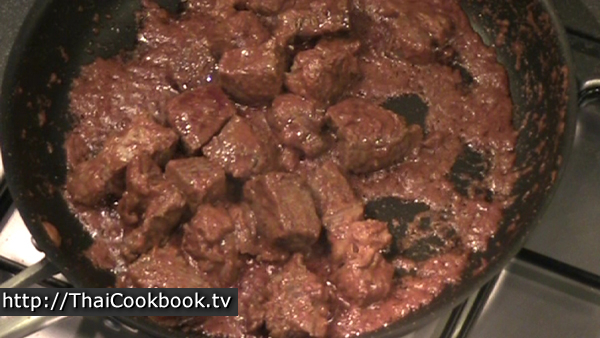 Add the beef to the pan and stir into the spices until it is well coated. 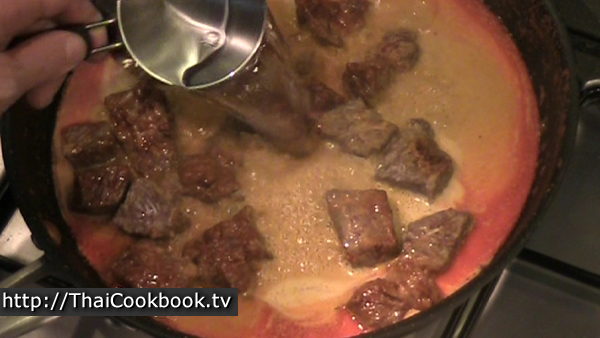 Put the lid on the pan and frying the meat on both sides until it it well sealed. 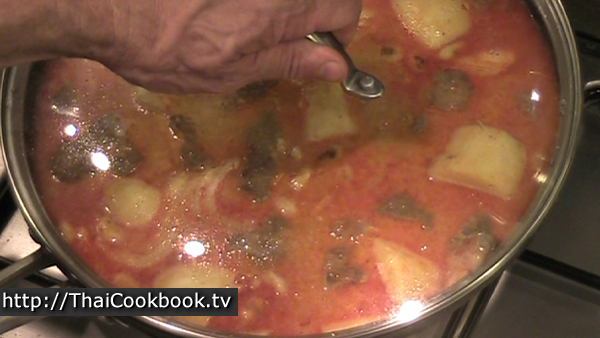 if you don't have a lid for your pan, then you will need to add a little water to keep the curry from drying out. If it get too thick it will burn. Add the second cup of coconut milk, stir in well, and let it get hot again. Add 2 cups of water, stir in well, and let it come to a nice boil. 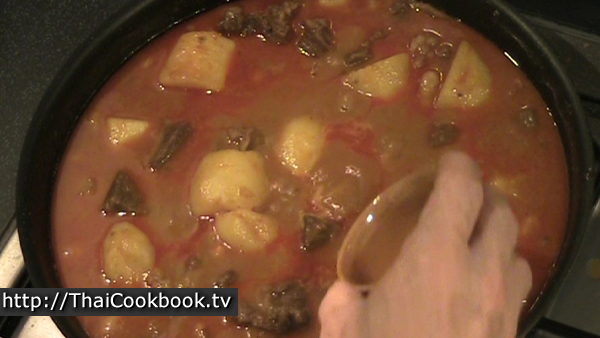 Add the potatoes, onion, peanuts, cinnamon stick, and bay leaf. Stir in well and bring back to a boil. Put the lid on the pan and simmer for about 1 hour, stirring occasionally to prevent sticking. Add more water, as needed, to nearly cover the ingredients, especially if your pan doesn't have a lid. 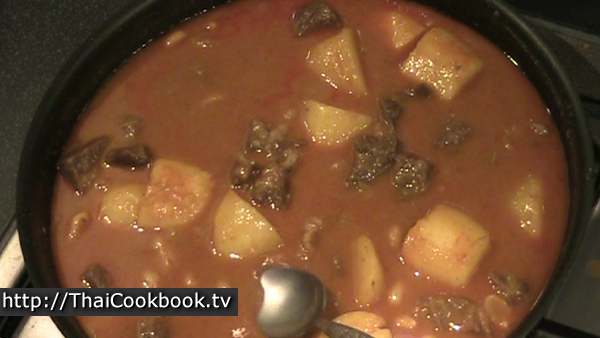 After simmering for an hour, taste the curry. You'll probably think that it doesn't taste good. We need to season it with sugar, citrus juice, and tamarind. Adding those flavors helps to liven up the spices and make them taste really good. Add the lime and orange juice and stir it in well. 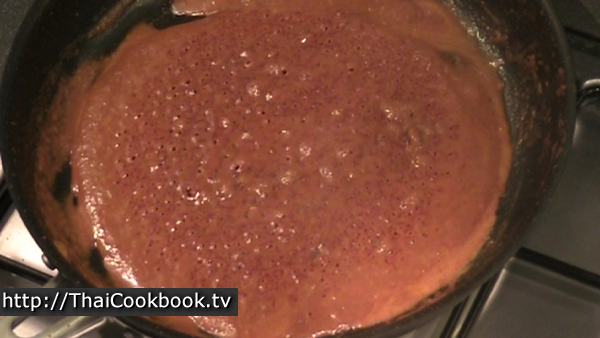 Add about half the sugar and half of the tamarind paste. Stir it all well and let it get hot again. Taste the curry again, and this time you should taste a big improvement. This dish should be sweet at first when you taste it, then all the spices come out and you'll taste cinnamon, cloves, anise, and other flavors. After swallowing it should leave a slightly sour taste. If it does, and tastes delicious like you remember Massaman tasting, then you've done well. If you think it needs sweeter or more sour, add more sugar or tamarind until it's perfect. Remove from the heat and let the pan sit for about 15 minutes, until it cools a little and the rich red oils come to the top. Serve in a bowl big enough to hold it all. 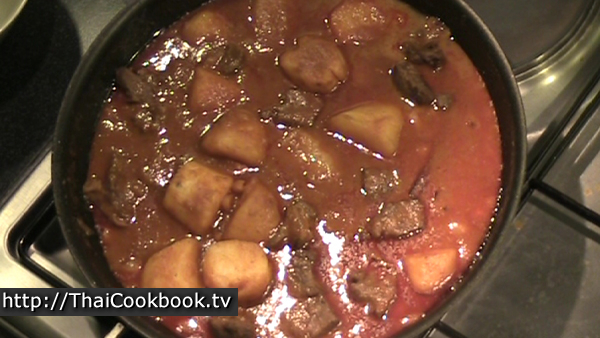 Arrange the chunks of beef, potatoes, and the cinnamon on top so they are sticking out of the stew. Garnish with a little slivered red chili and kaffir lime leaves. Thai curries should be served in a bowl that is shared between the diners, with each person having a small plate of steamed white rice. A small amount of curry is spooned from the bowl with your own spoon, mixed with some rice, and eaten.